It was more like a hamlet than a village. A simple collection of stilted wooden houses perched on the side of a mountain overlooking seemingly-endless rows of rice terraces, but even after a long and tiring day on the back of a motorbike passing through startling terrain it was hard not to be caught breathless by its isolation and beauty in the twilight. The primitive village of Ban Hieu is inaccessible except by motorbike or on foot – it's up a long, steep and winding two-metre-wide dirt path flanked on one side by a sheer drop into the paddy fields far below. It was precisely the reason I had set off the previous day along paths once used by the Vietcong to deliver weapons and supplies to the armies fighting in the south during the Vietnam war. The Ho Chi Minh Trail has always been the stuff of legends, a seemingly endless number of backwater paths and trails that started near Hanoi and ran almost 1,000 miles down the length of the country, crossing into Laos at several points, and ending near Saigon (today's Ho Chi Minh City) where it deposited weapons into the hands of the communist guerrillas fighting against US and Southern Vietnamese forces. Despite intense aerial bombing the weapon caravans continued for years, and gave the Vietcong the means to continue the fight and eventually overcome the south's resistance. Four decades later many of these paths have barely changed. Clogged with mud, they wind their way through the mountains, linking still-isolated communities and then barrelling down into the valleys through endless flooded rice fields. A dirt biker's dream, a casual rider's uncomfortable reality. It had not started well. Within a few hours of leaving I was lying battered and bleeding on the ground, with pieces of wet gravel embedded in my skin, a bruise where my dictaphone had smashed to pieces against my hip, and the arm of my bike jacket ripped open – all a consequence of having skidded off my bike when a truck pulled out into the middle lane in front of me on the wet highway without warning. With little chance to dwell on the fall and already far from civilisation, I had simply but shakily climbed back on the bike and, following Dang Van Diep, our smiling, non-English-speaking mechanic (who would himself tumble off his bike going down a steep mud path the following day), soldiered on. An hour later the fall was already far from my mind as I emerged for the first time from a patch of mountain fog to look down upon the vast, green landscape of rural Vietnam stretching out before me. The view would repeat itself regularly over the next few days (and would never cease to thrill) as our small convoy climbed and descended thin mountain paths, crossed through knee-deep rivers, and rode through dozens of isolated villages of smiling and waving children. All the while we were flanked by miles upon miles of muddy rice paddies filled with young and old women cultivating the land by hand as they and their ancestors have done for centuries. The Ho Chi Minh Trail was once called "one of the great achievements of military engineering of the 20th century" by the American National Security Agency, but for the most part the areas the various trails pass through were and remain very rural and focused on the basic needs of living. I soon found a simple but beautiful monotony in riding through these lush green areas, with long hours between stops passing in a meditative blink of the eye. Yet by the end of each day, as the strain of holding firm to the throttle as the bikes bounced over rock and skidded through mud, thoughts of that night's accommodation slowly crept into our minds. We spent the first night in Mai Chau, a scenic village without roads 135km from Hanoi that is quickly being discovered by tourists looking for somewhere off the beaten path. By the following day we'd left the tourists behind and had only the simple, smiling silence of Diep for guidance and company. That night, after 10 hours on the bikes, we arrived at the truly isolated Ban Hieu. As I dismounted unsteadily from my bike outside the small stilted home we were staying in for the night and went to dunk my head in the nearby stream to wash away the sweat and mud of the day I was stopped in my tracks by the view in front of me. A village of a few dozen families, an hour by motorbike from the nearest community with a shop, and inaccessible by car, it felt like a forgotten land. 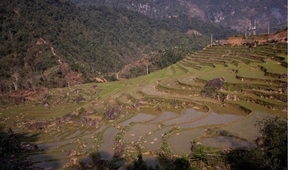 The manmade rice terraces – irrigated by intricate bamboo piping snaking down the hillside – and other human intrusions all felt in harmony with nature, and in the miles upon miles of land spread out before us, no city, town, or even single human dwelling was in sight. Our smiling hosts were already pouring hot water for us and preparing food and beds for the night as I returned. Despite having no common language, the extended family was soon showing us pictures of their children, away at school, and their grandparents, long deceased, who would have been alive when the Vietcong passed through on their way south. The guerrillas may have even stopped, like us, for hospitality for the night, staying in homes not much different from the one we now found ourselves in. With the light fading outside it was hard to stay awake and I stretched out on one of the mattress laid out on the floor, searching for a comfortable way to sleep without lying on my bruised shoulder and hip. The following day at dawn we started our journey back north, reaching the noisy and crowded streets of Hanoi by nightfall. Despite one bad fall, aching limbs and over 300-plus miles of dirt trails on the back of a relic of the Soviet Union, it was hard not to turn the bike around and head back out to continue down the trail southwards.